Sketch (not to scale) of the proposed components in the Proxima Centauri planetary system. Question marks indicate marginally detected features. Given the low luminosity of the Proxima Centauri star, we estimate a characteristic temperature of about 40 K for this dust, which might constitute the dust component of a small-scale analog to our solar system Kuiper belt. The estimated total mass, including dust and bodies up to 50 km in size, is of the order of 0.01 Earth masses, which is similar to that of the solar Kuiper belt. Our data also show a hint of warmer dust closer to the star. 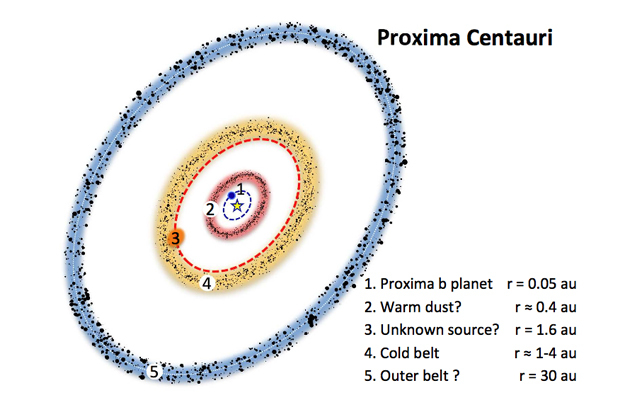 We also find signs of two additional features that might be associated with the Proxima Centauri system, which, however, still require further observations to be confirmed: an outer extremely cold (about 10 K) belt around the star at about 30 au, whose orbital plane is tilted about 45 degrees with respect to the plane of the sky; and additionally, we marginally detect a compact 1.3 mm emission source at a projected distance of about 1.2 arcsec from the star, whose nature is still unknown.